The Red Bull Air Race World Championship is the aviation equivalent to Formula One car racing. The international tour, rock-star pilots, epic venues and groupie fans are all part of the scene. And even when something like the weather spoils a competition, there is still plenty to see and enjoy. Last weekend, the race made its first-ever stop in Las Vegas, Nevada. The race venue would be the Las Vegas Motor Speedway, where familiar names like Stewart, Gordon and Earnhardt would be replaced by names like Bonhomme, Chambliss and Lamb. The folks from Red Bull said that when they choose their racing venues, they look for something with an epic backdrop. I guess you could argue that the Las Vegas skyline is pretty epic, but it's 20 miles away from the LVMS, and the race doesn't occur at night. The mountains in the distance did frame it pretty well, but paled in comparison to past races over the water in places like Budapest and San Diego. Saturday was the day for Masters Class qualifying and the Challenger Class race, which is essentially the AAA team of racers. I noticed there didn't seem to be many people in the stands. I never heard an announced attendance, but there had to be less than 5,000 people there, which made a giant NASCAR venue like the LVMS seem downright empty. The 90-degree sun beating down on the metal bleacher seats was pretty brutal, and there wasn't much of a breeze to relieve it. The souvenir shops had no trouble selling hats and sunscreen. I assumed the attendance was low on Saturday because it wasn't the main event race. Sunday was a completely different story. While the temperature was much more comfortable, the winds had kicked up and were gusting to about 30 miles per hour. The stands looked to have about the same number of people as Saturday. Once the course managers managed to get all of the race pylons inflated, racing began. The first pilot on the course was Paul Bonhomme of Great Britain, who held the overall points lead for the World Championship. After his first lap through the course, he disqualified himself by exceeding the 10G limit while pulling up and circling back for lap 2. 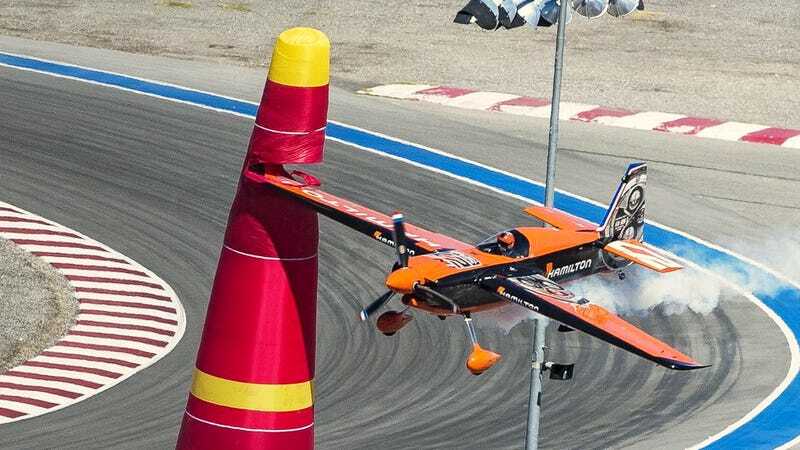 The next racer, French pilot Nicolas Ivanoff knifed the wingtip of his Edge 540 through a pylon at gates 4 and 5 (top photo) on his first lap, and received a 2-second penalty for each infraction. Normally, this would have put him out of contention, but because Bonhomme DQ'ed, Ivanoff won his heat and moved on to the Super 8 round. "We were well within the rules of our own regulations with what was allowed, monitored with Nellis [Air Force Base], absolutely tried to give the race its best chance. The pylons started having challenges. The bigger challenge was keeping the pylons erect. That's a safety issue for us. At that point we began to look at whether we were going to continue or not." "It's not quite how I imagined it, but that's racing. That's the sport. I was in the best position [fastest qualifier] to take advantage of an outcome like this. The wind is something we fly in all the time. Ultimately today it was the limit of the pylons. We all want to put on a great race and a great show for the fans. Las vegas was good to me, I got on the lucky side of the dice." Going into the Las Vegas race, Nigel Lamb was tied for 2nd place in the standings, with Hannes Arch of Austria. Both pilots were only one point behind Paul Bonhomme. But Lamb's 2nd place finish in Las Vegas vaulted him into the overall lead, with one race left. Lamb has yet to win a World Championship , but he was on the podium in 2010 with a third-place finish. Overall, it's an awesome event to behold, and it's sad that it was so poorly-attended. I think the heat and distance from the city were factors. Admission prices were only $39 for a weekend pass, which is very reasonable for entertainment that spanned 5-6 hours, and also included performances by stunt bikers, sky divers, and Red Bull's aerobatic helicopter pilot Chuck Aaron. I'd love to attend another race sometime. Going into the final race of the season with 53 points, Nigel Lamb now leads Hannes Arch, with 48. Paul Bonhomme slipped into third place, at one point behind Arch. McCleod now sits in 4th place, but for him to get a medal for the season, Lamb, Bonhomme and Arch would all have to place between 9th and 12th, scoring zero points. The final race of the season will be in Spielberg, Austria, so we know Hannes Arch will be trying his best to win in his home country. In follow-up posts I'll be sharing answers to interview questions I asked of Kirby Chambliss and Hannes Arch, plus I'll also go into a lot more detail about the sport itself — the places, the races, and their history. What would you like to know about the Red Bull Air Races?